After twelve years spent serving reliably excellent rustic Italian cuisine, Dopo reinvented itself as “Palmento a Dopo,” adopting all-Sicilian menu that draws inspiration from chef-owner Jon Smulewitz’s family roots in Sicily and his annual trips to explore the island’s rich food and wine culture. 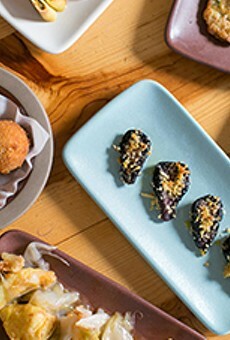 You see the Sicilian imprint most clearly in the daily-changing cold and hot antipasti section of the menu, which is served as an extended sequence of tiny plates, each one consisting of no more than a couple of bites. These might include airy-light fresh ricotta, chilled cuttlefish tossed with fava beans and little nubs of ricotta salata, and an assortment of deep-fried pasta or risotto balls. Meanwhile, Dopo’s pasta dishes remain some of the best in town, and although the entrée selection tends to be somewhat limited, that just gives us more reason never to pass on the decadently rich polpette all’Etna — chicken-and-pancetta meatballs cooked in between citrus leaves.